The Montafon is located in Austria in the western Province of Vorarlberg at the border to Switzerland in the Montafon Valley, situated in an alpine landscape in the Eastern Alps (Figure 1). 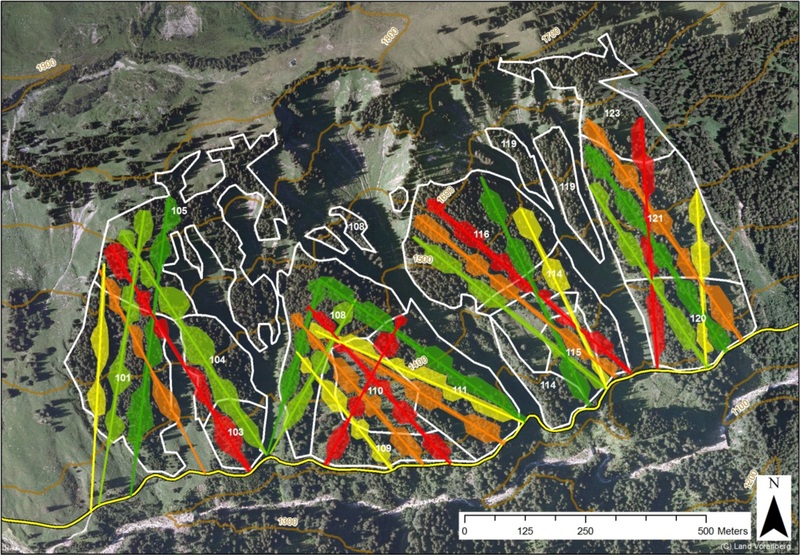 The MOTIVE case study sets focus on the largest forest holding in the Province of Vorarlberg, the Stand Montafon Forstfonds (SMF). 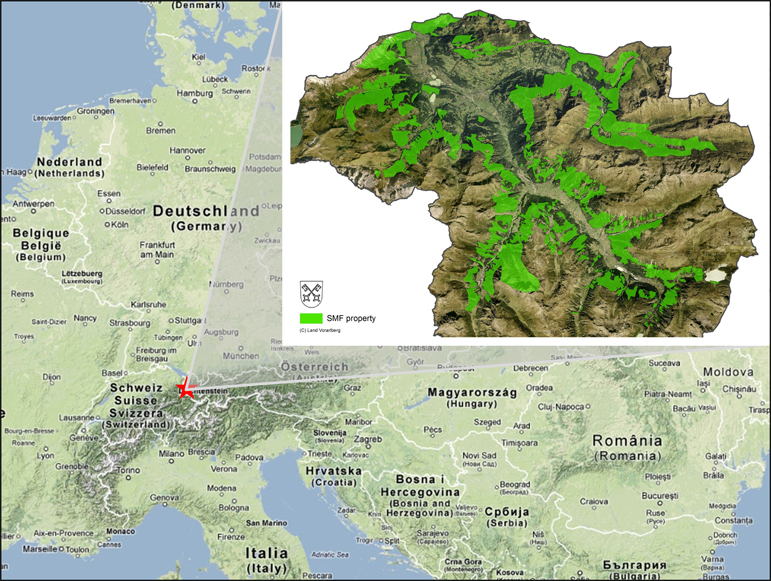 Figure1: Location of the Montafon case study. 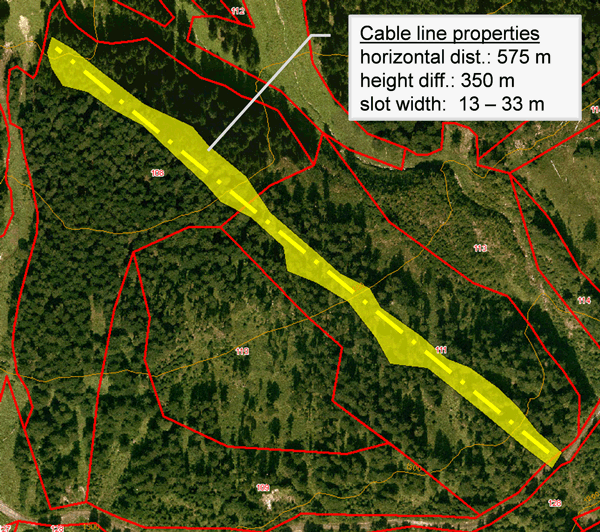 Small insert: green areas are forest property of the forest holding SMF (Stand Montafon Forstfonds). The Montafon valley is part of the administrative district Bludenz. The size of the district is 187.52 km² and it is populated by 61,298 citizens (48 inhabitants/km²). The rugged alpine topography in the district of Bludenz limits settlements and pastures mainly to the valley floors (Figure 2). The regional economy depends on tourism (skiing in winter, hiking and mountaineering in summer), dairy farming on grasslands and mountain pastures, hydropower and forestry. Figure 2: Land use statistics of the eight municipalities of the Montafon region (source: CORINE land cover EEA 2006). 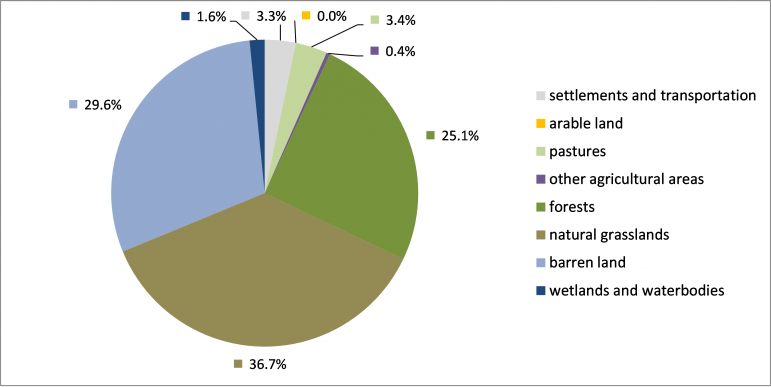 The forest ownership in the district of Bludenz is dominated by small scale forest owners <200 ha which account for 42.9% of the forest area (Figure 3). 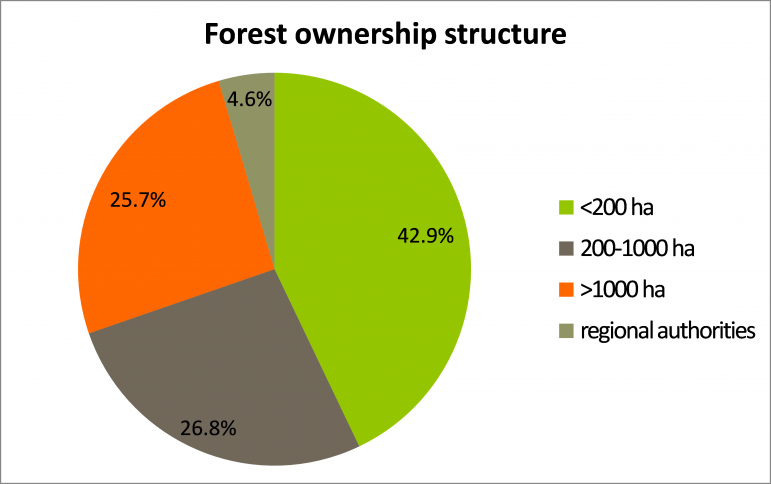 Figure 3: Forest ownership structure in the district of Bludenz (source: Austrian Forest Inventory). The climate is temperate (oceanic) with annual mean temperatures between 1 °C (at 2000m asl) and 8 °C (at the valley floor at 700m asl) and an average annual precipitation between 1000 and 1600 mm (Figure 4). At the valley floor the average number of days with snow cover >1cm is 96.3 days per year while in higher altitudes this increases substantially and at the timberline the maximum snow depth is more than 300cm and the number of annual days with snow cover exceeds 200. The anticipated climate change features a distinct increase in temperature. The range of expected temperature increases in available regional climate change scenarios is 2.5 to 4.5 °C at the end of the 21st century. No major changes are expected for precipitation (Figure 5 and Figure 6). 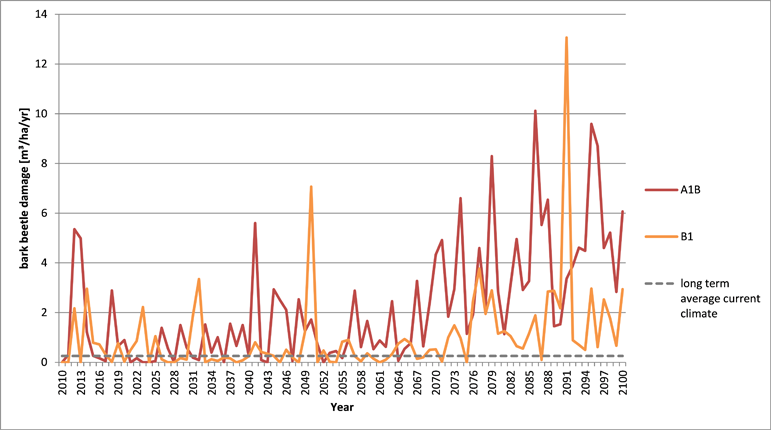 Figure 4: Climate characteristics of the weather station Vandans (670 m asl) in the valley bottom (left) and of the weather station Obervermunt (2040 m asl) at the timberline (right) for the period 1971-2000 (source: Central Institute for Meteorology and Geodynamics). 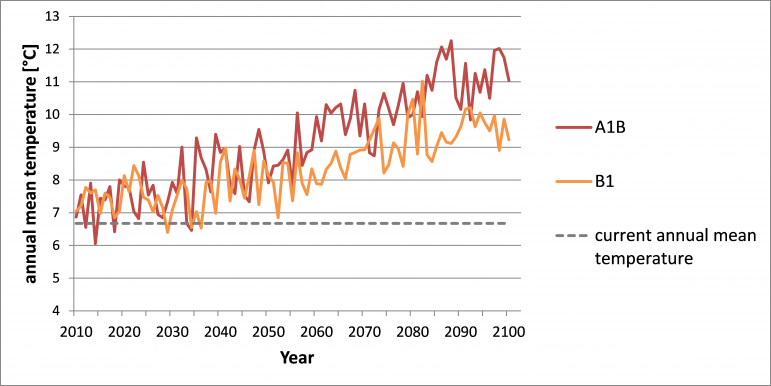 Figure 5: Expected temperature increase for the 21st century according to climate change scenarios A1B and B1 as provided within the MOTIVE project (based on CLM/ECHAM5 data, for more information please see Zimmermann 2010, and MOTIVE D2.2 Climate and land-use data). Figure 6: Expected precipitation changes for the 21st century according to climate change scenarios A1B and B1 as provided within the MOTIVE project (based on CLM/ECHAM5 data, for more information please see Zimmermann 2010, and MOTIVE D2.2 Climate and land-use data). The Montafon features a steep altitudinal gradient from ca. 600 m at the valley entrance up to 3312 m at the summit of Mt. Piz Buin. The vegetation belts range from the submontane up to the nival zone. The actual timberline is located at approximately 1800 to 2000 m asl depending on the local climatic and edaphic conditions. The geology in the northernmost part of the Montafon is characterized by calcareous bedrock (limestone and dolomite) whereas in the larger southern part crystalline bedrocks (e.g. gneiss and amphibolite) dominate. On calcareous bedrock rendzinas, luvisols and cambisols are dominating. Ranker, podsols, semi-podsols and shallow cambisols are the most important soils on crystalline parent rock material. A quarter of the total area of the Montafon valley is forested. The forests are dominated by Norway spruce (Picea abies, 96% of growing stock) and silver fir (Abies alba, 3%) with some admixed European beech (Fagus sylvatica), sycamore maple (Acer pseudoplatanus), ash (Fraxinus excelsior), Scots pine (Pinus sylvestris) and European larch (Larix decidua) (see the major forest types in figure 8). 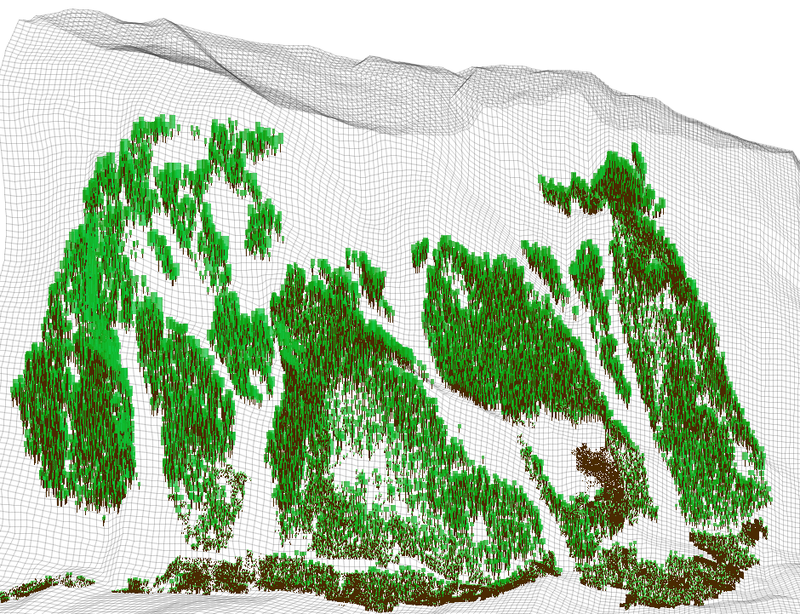 The largest part of the forest is located on steep slopes which require skyline based logging techniques (Figure 9 and Figure 10). 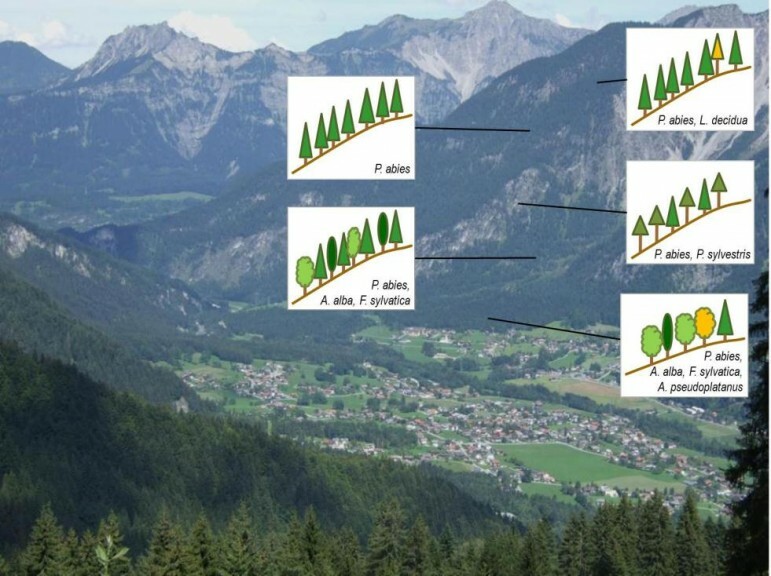 Figure 8: Major forest types in the Montafon case study along an altitudinal gradient. Figure 9: Management on the steep slopes is relying on skyline based logging techniques (photo: Stand Montafon Forstfonds). 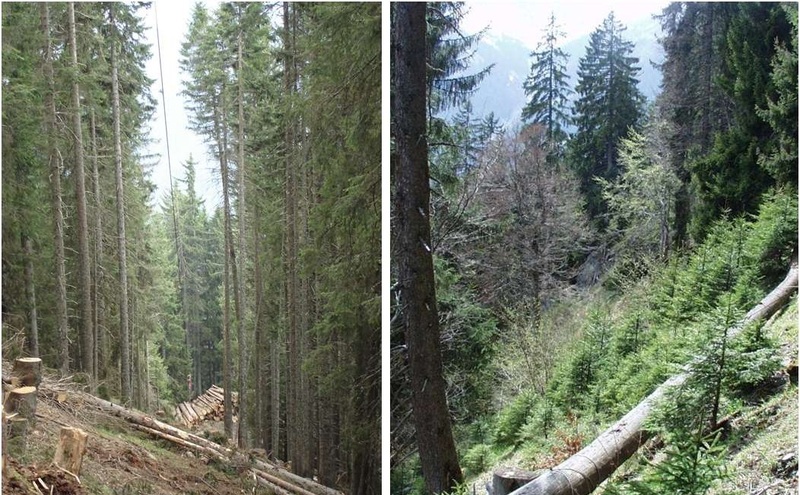 Figure 10: View along a skyline track at the time of harvesting (left) and 15 years after logging (right) (photo: Stand Montafon Forstfonds). The employees of the SMF as well as the eight municipalities and their citizens are internal stakeholders. The latter group is of particular relevance due to the timber and grazing rights of local citizens.All other stakeholders are classified as external stakeholders. Tourism, both winter and summer, is a very important economic factor in the region and thus the sector is particularly relevant. Hydropower is another big issue in the region where the hydropower companies are interested in smooth runoff and erosion processes under control. The forests of the Montafon serve as sources of timber and fuelwood for local citizens (many in possession of historic timber rights) and the sawmilling and wood processing industry as well as for biomass heating plants. Public administration services responsible for law enforcement are the forest administration and the nature conservation administration department. 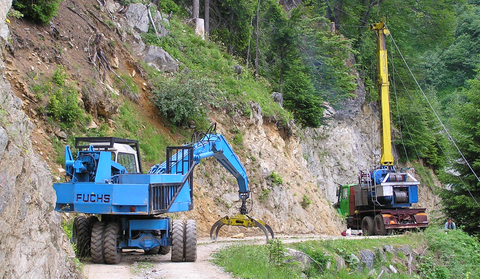 The service for avalanche and torrent control is a particularly relevant stakeholder as most of the forests serve protective functions against gravitational natural hazards, like snow avalanche, rock fall and landslide (Figure 11), debris flow, erosion, and flooding and because the public interest in protective services is huge. Hunters as another influential stakeholder group are represented by the provincial hunting board. Figure 11: A limestone rock retained by beech trees (left, photo: Rupert Seidl). 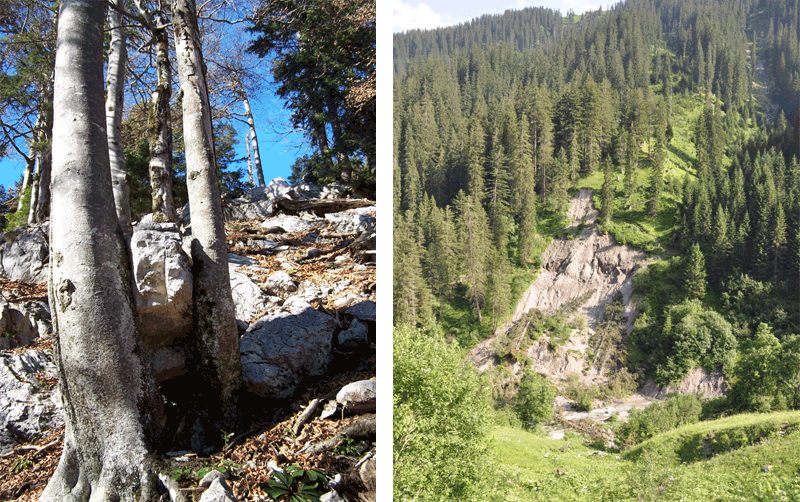 Landslide erosion of lateral moraines on forested slopes (right, photo: Manfred J Lexer). 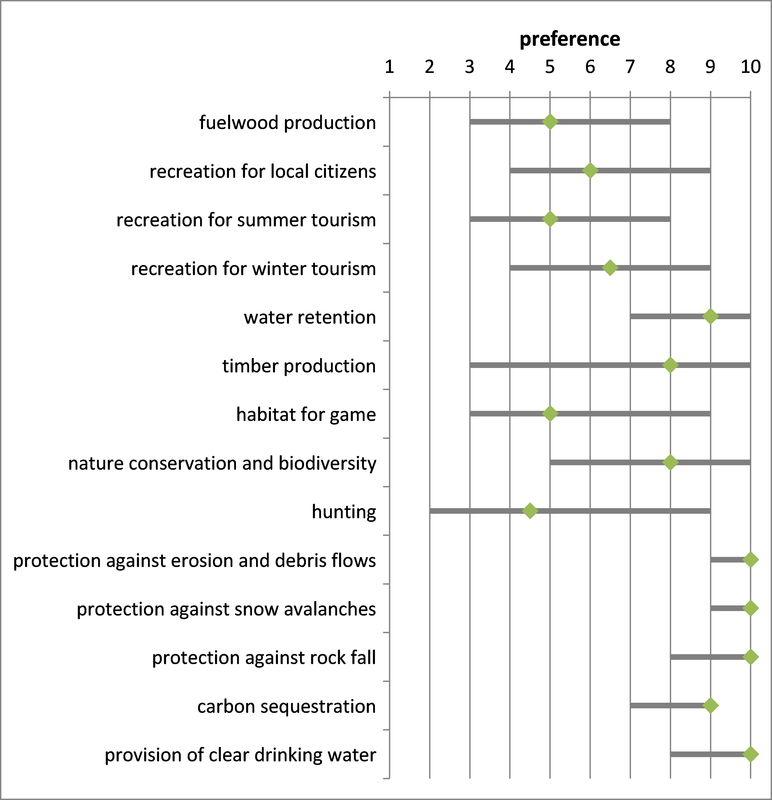 Figure 12 displays the distribution of regional stakeholder preferences regarding a set of forest ecosystem services. In general the protection against gravitational natural hazards is of paramount importance to all stakeholders. 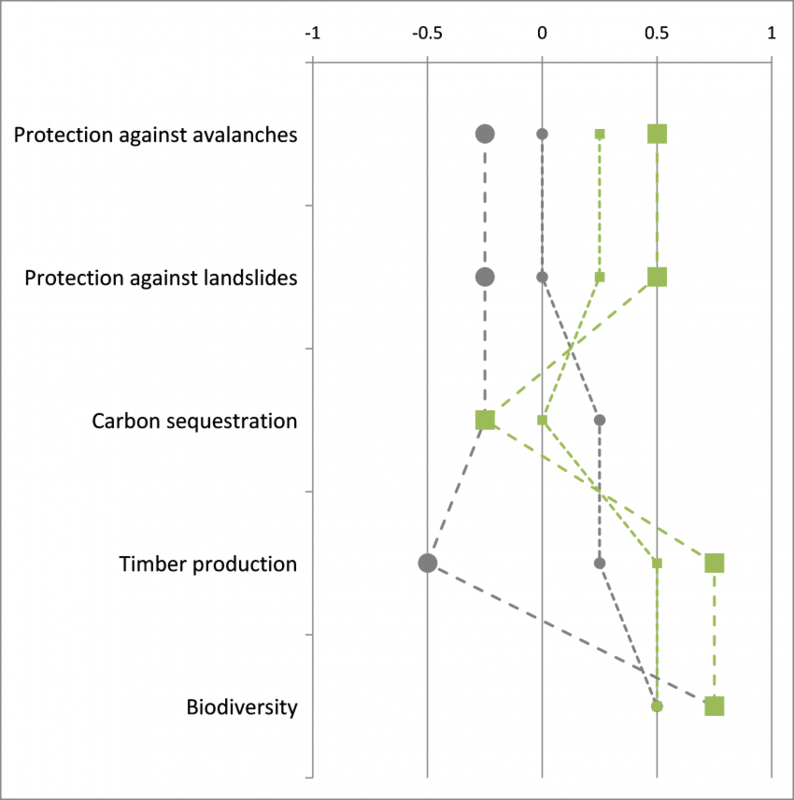 Figure 12: Importance of forest ecosystem goods and services (1=low relevance, 10=high relevance) in the Montafon. Grey bars represent the response of a panel of (n) different stakeholder representatives. Diamond symbols indicate the median, the grey lines indicate minimum and maximum values. The Stand Montafon Forstfonds (SMF) is the largest forest holding in the Province of Vorarlberg. SMF is some kind of a community forest. There is a long tradition in public land-use in the Montafon region. The inhabitants of the valleys of the Montafon have had the chartered right to use the non-private forests in their valleys as a source for timber and fuelwood since the year 1601 AD. The ownership, however, was held by the state until the year 1832. In the year 1832 eight municipalities in the Montafon purchased approximately 8000 ha of forests from the state. Since then these municipalities have the unseparated ownership of this land and established the SMF for its management. 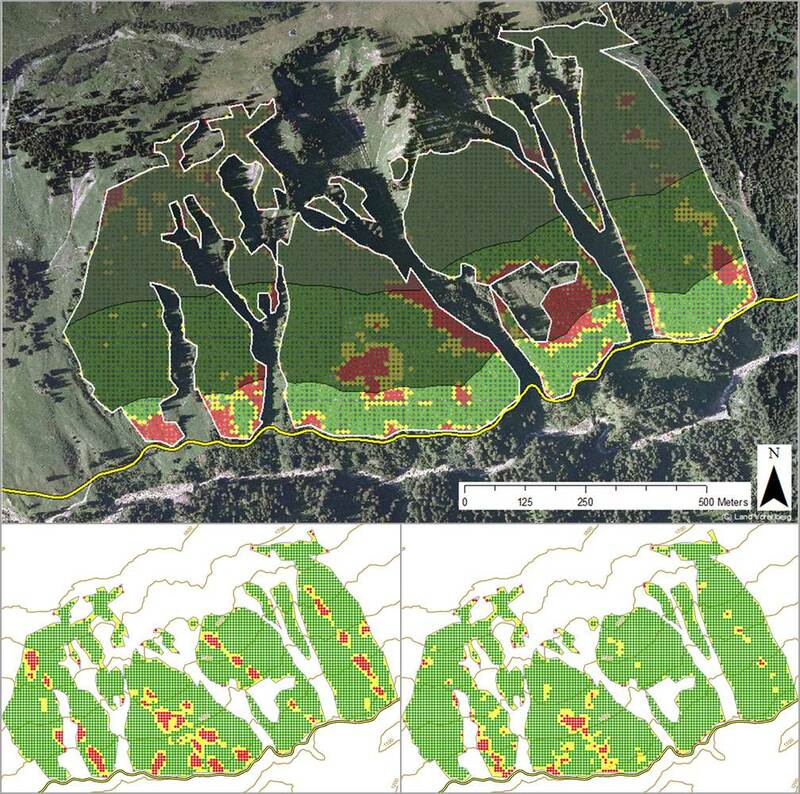 The area owned by the SMF nowadays represents 8474 ha of which 6470ha are forests (Table 1, Figure 14). Figure 14: Area shares of the eight municipalities of the SMF. Table 1: Municipalities and their share of the SMF area. The responsible body of the SMF is the board whose eight members are commissioned by the eight municipalities, one member for each municipality. All board members have equal voting rights. The chairman is elected by the boardfrom among its members. The operational management is run by a managing director who has to consult the chairman of the board in issues of fundamental relevance (e.g. acquisition or sale of land). Strategic decisions are made by the board. The SMF has seven permanent administrative employees and up to 15 lumbermen. Additional regional workforce is contracted based on demand. The returns from business operations are reinvested, in case of financial losses the municipalities are held liable. The management objective of the SMF is the sustainable and economic use of the forest resources for all possible demands of society. Most notably this is the fulfillment of servitudes and the sustainable production of timber and the protection of the (cultural) habitat Montafon. The interests and demands of the citizens (internal stakeholders) of the Montafon are represented by the board of the SMF consisting of eight members (one member per municipality). There is no explicit participatory approach to consider the demands of external stakeholders. However, there are long-standing informal processes which grant the respect for stakeholder needs and interests. The law-enforcement of the Austrian forest law is conducted by the forest administration at the district level. The management plans designed by the SMF are approved by the forest administration after an informal review process for periods of e.g. 10 years. There is no prescription of forest management by the authority. Typical for the Montafon region, the bigger part (82%) of the SMF forest area are forests with a dominating protective function. This is also reflected in the Forest Development Plan which is issued by the forest authority (cf. figure13). This forest land use plan serves as a basis to enable the SMF to apply for increased subsidies for forest management, due to the relevance of forest stands for the protection against natural gravitational hazards.